Texas Judge Says DACA Is Probably Illegal, But Leaves It In Place Federal District Judge Andrew Hanen had ended a similar Obama-era program, but he declined to halt DACA, saying the coalition of opposed states waited too long to bring their lawsuit. 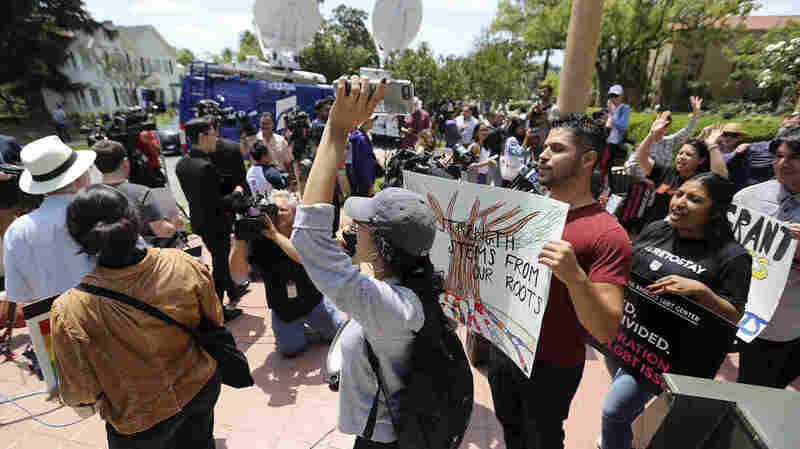 Supporters of the Deferred Action for Childhood Arrivals Act and others demonstrate outside the 9th Circuit Court of Appeals in Pasadena, Calif., in May. The Trump administration failed to convince a U.S. appeals court that it was justified in ending the program, but a Texas judge on Friday ruled in a separate case that DACA was likely illegal.